The Polk Audio VS 265-RT unique, wafer-thin grille is magnetically secured to deliver nearly transparent, ultra-small perfs and dynamic, unimpeded sound. Polk Audio VS 265-RT Patented bass venting design smoothly transitions air flow, eliminating turbulence and distortion, for deeper, more efficient bass impact. 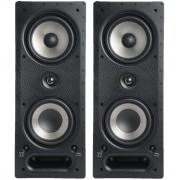 Polk Audio VS 265-RT Lower tweeter levels offset reflective surfaces, cutting the level in the exact 4-5kHz band where reflectivity destroys sound quality. 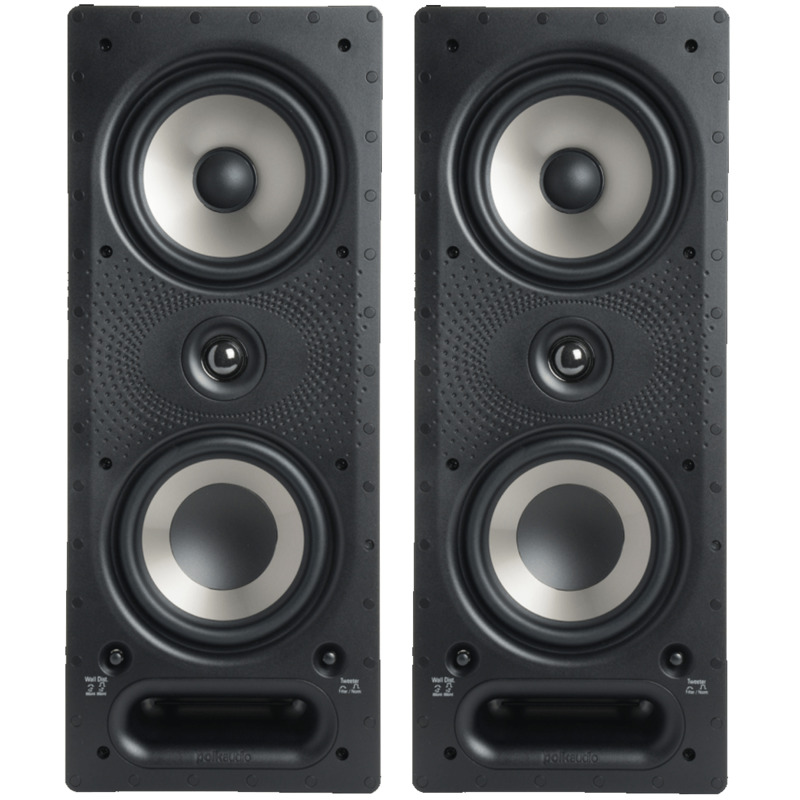 Polk Audio VS 265-RT Crossover adjustments flatten response bumps caused by nearby walls, reducing “boominess” for more lifelike sound from any position. Polk Audio VS 265-RT Perfect Fit templates, a precision flange, available pre-construction brackets and the patented Rotating Cam system ensure secure, vibration-free installation. 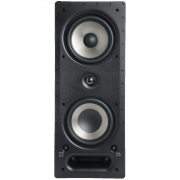 The Polk Audio Vanishing Series 265-RT in-wall loudspeaker features a precision-engineered, minimally flanged design. 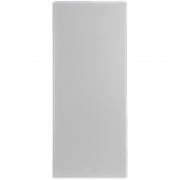 Polk’s exclusive Sheer-Grille protrudes only 7mm from its surroundings, and installs virtually-flush in your wall. Mounting the speaker is simple with a one-cut, drop-in installation and the rotating cam stabilizing system. The speaker provides superior high-performance sound from its dual 6.5″ woofers and aimable 1″ tweeter with Reflective Room Compensation control. Laser-imaging technology allows Polk Audio VS 265-RT engineers to see the entire vibrating surface of a driver and tweeter. This allows the engineers to actually see performance-robbing distortion develop on the speaker cone. Using this data, they can determine the Dynamic Balance of their high-tech materials, and alter the geometry and construction of the speaker to effectively tune out the offending resonance. Exclusive Dynamic Balance Composite Material Technology delivers sound that is effortlessly clean and clear, even at lifelike volume levels. The Klippel Distortion Analyzer allows Polk engineers to optimize each driver’s motor structure, voice coil alignment and suspension to insure smooth, unimpeded movement even at extreme listening levels. This is especially important in the shallow depth area afforded an in-wall loudspeaker. The Polk Audio VS 265-RT in-wall loudspeaker employs dual 6.5″ Dynamic Balance mineral composite polypropylene cone woofers with rubber surrounds for a smooth, consistent frequency response. The drivers feature a lightweight, strong composite basket that works in conjunction with Klippel Optimization to keep moving parts in rigid alignment while further damping performance-robbing resonances. The Polk Audio VS 265-RT speaker employs a 1″ Dynamic Balance silk polymer composite dome tweeter for crisp, clear imaging. The high-performance tweeter features a 15° swivel housing, for more direct high frequency control, excellent off-axis imaging and more placement flexibility. The Polk Audio Vanishing Series in-wall loudspeakers are timbre-matched to Polk Audio’s high-performance RTi bookshelf and floor-standing loudspeakers. This allows you to match them to an existing Polk Audio home theater speaker system and enjoy seamless blending from speaker to speaker. 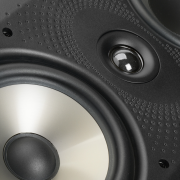 Timbre-matched speaker components will insure the same true response throughout your system. The overall frequency response of the in-wall speaker is 30Hz to 27kHz, and the -3dB frequency response is 45 to 25kHz. Infinite Baffle Tuning uses the virtual enclosure of the in-wall space for deep bass response and superior overall sound. The Polk Audio VS 265-RT features Polk Audio’s patented PowerPort Bass Venting. The oblong-shaped port has rounded edges which smooth air turbulence at the mouth of the port to eliminate distortion. A foam rubber port plug is included, and should be inserted when the speaker is installed in an area larger than a standard open stud bay. The Polk Audio Vanishing Series in-wall speakers feature Polk’s exclusive wafer-thin Sheer-Grille, a magnetically-secured grille that protrudes only 7mm from its surroundings. The Sheer-Grille can be painted to match your décor, making it virtually indistinguishable from its surroundings. The Sheer-Grille has nearly transparent, ultra-small perfs, and are acoustically inert, for dynamic, unimpeded sound and more uniform coverage, even in larger rooms. The Polk Audio VS 265-RT has a gold-plated pair of spring-loaded binding posts that can accept up to 12-gauge wire, single banana plugs, or pin connectors. 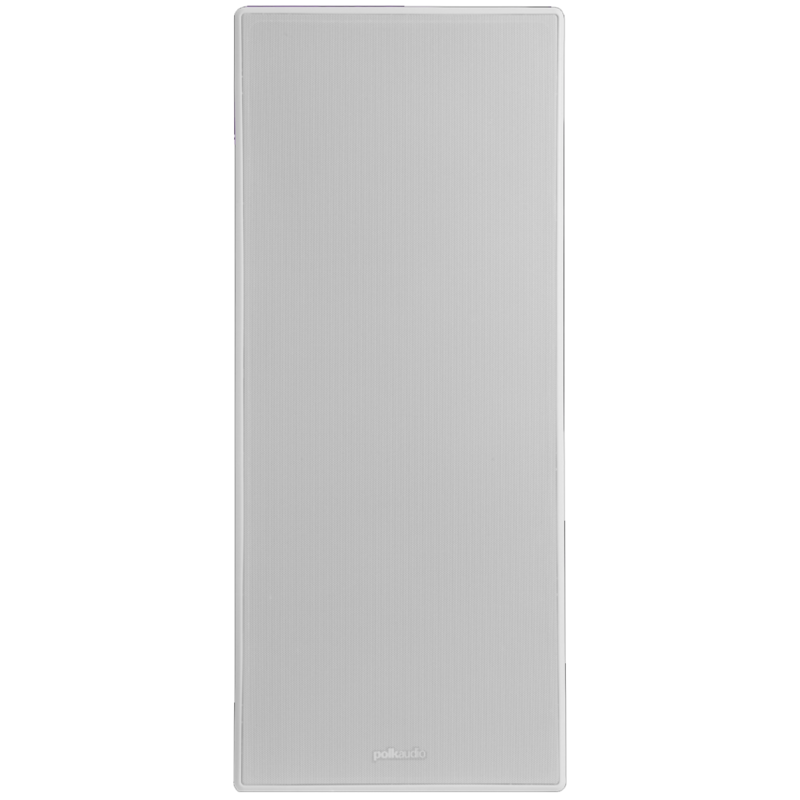 You can use the Polk Audio Vanishing Series in-wall loudspeaker as main left and right speakers mounted alongside your flat screen TV, or for superior dynamics in practically invisible multi-zone music systems. The speaker utilizes a rotating cam system to ensure a secure, vibration-free installation. There are eight rotating cams to hold the speaker securely to the wall.